Last week I posted a basic cornbread recipe. I suspect some folks reaction was "ho-hum". So this week I'm showing that you can, indeed, do more with corn meal than just make cornbread. How about a yeasted bread with corn meal? 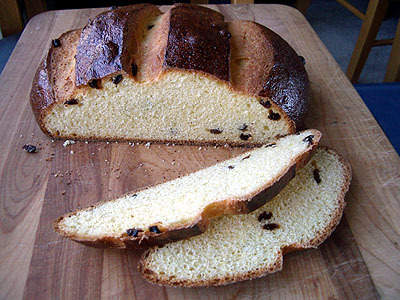 How about a sweet raisin yeasted bread with corn meal in it? Sound good? It did to me. The recipe and a lot more photos are below. I based this one on a recipe from a little Betty Bossi baking book that my father-in-law brought back from France (Betty Bossi is, I gather, like a Swiss equivalent of Betty Crocker). My French is fair, as is my metric system, but thanks to my scale, which can toggle from metric to imperial, I was able to pull something together pretty quickly. I'm going to print the recipe with the original metric measurements. Next to each I'll include my imperial approximation, which also include my substitutions. My translations and measurements aren't exact, so if you are a stickler you can use the metric measurements or do the math yourself! Mix the corn meal and the water together in a small bowl and allow to soak for half an hour. Pour two cups of the flour in a bowl and combine with the yeast, sugar, salt, and saffron. Make a well in the middle and pour in the corn meal soaker, remaining milk, and butter. Stir until well blended. Stir in the raisin and then add additional flour by the handful until the proper consistency is reached (tacky to the touch but not sticky, and clearing the sides of the bowl when mixed). Pull the ball of dough out of the mixing bowl and place it onto a clean work surface. Knead the dough for 10 to 12 minutes, until it begins to feel smooth and satiny. Place the dough back into a clean, oiled bowl, cover with plastic wrap, and allow the dough to rise until it has doubled in size, roughly 90 minutes. Remove the dough from the bowl and gently degas it, then shape into the desired shape. 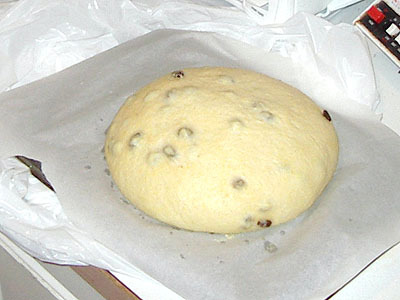 Cover the dough with plastic wrap or a moist towel and allow it to rise until doubled in size again, roughly 45 minutes to 1 hour. While it is rising again, preheat the oven (and baking stone, if you are using one) to 425. 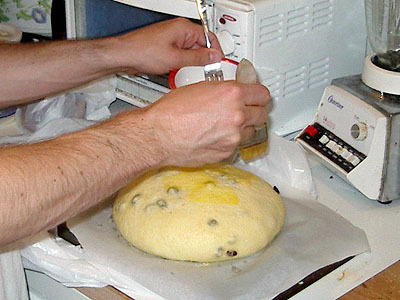 When it has doubled in size, glaze the loaf with egg wash made from the egg yoke, water, salt, and sugar. Score the loaf so that it doesn't tear in the oven, and then place it into the preheated oven. After 5 minutes, reduce the oven temperature to 350 degrees. After 15 minutes rotate the loaf so that it bakes evenly, and then bake it until it is done. You'll know it is done when it is nice and brown, sounds hollow when tapped on, and reaches an internal temperature of at least 185 degrees. In my oven this took around 40 to 45 minutes. 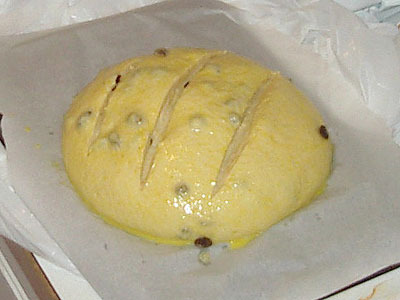 Allow the loaf to cool for at least half an hour before slicing. I was very pleased with this loaf, but I have some ideas I'd like to try to make this bread even better. One idea is instead of using 1 cup of medium grind corn meal, use a mixture of finely ground corn flour and coarsely ground polenta. Something along the lines of 3/4 cup corn flour and 1/4 cup presoaked polenta ought to lend the loaf a smooth, creamy crumb with a few crunchy bursts of polenta here and there. The other idea I have is to substitute honey for sugar, and maybe increase the amount of sweetener just a tad. The thought is that I might be able to get a flavor something along the lines of cornbread with honey butter baked right into the loaf. I haven't tried it yet, but it sounds good. Olive oil instead of butter might be good too. So many options... and never enough time to bake! Have any ideas for other ways to modify this loaf? Or questions about it? Please comment! woooo. I bet this would be yummy in that bread pudding I'm going to make. Addendum: I made this loaf again using corn flour instead of corn meal. It came out much smaller and I feared it was going to be too dense to eat. But, in fact, it was still wonderful toasted, with the corn flavor spread throughout the loaf instead of just in the crunchy little corn meal nuggets. I think with this one I was able to pinch it tight enough on the bottom that there was pretty good surface tension keeping it in shape. But that is not always the case. The trick I've been using for really slack doughs is that I bought a couple of cheapo baskets about 8 inches around at Goodwill (my discount version of the fancy bannetons they sell at kitchen stores). I line them with kitchen towels, sprinkle some flour on the towels, and then place the balls of dough in them while they are rising. I pull the dough out of the baskets just before popping them in the oven. They definitely preserve their shape better this way. Scissors for scoring... makes it look so fancy! Mini - loaf of outstanding beauty! Wow, wow, WOW! I just love this loaf! How absolutely beautiful. Not to mention Floyd's recipe sounds out of this world since I love any type of corn bread and rasins, too. I'm going to have to add this to the long list of "to make" but I doubt I can do it as beautifully as you have. Get yourself some clean scissors and get ready. Sticking both points in dough at the same time: First cut outline of a "square" on top not letting corners touch. Then add 3 snips to form squares at 12 oclock 3, 6, and 9 repectively. Add some snips inbetween and "wella!" finished. 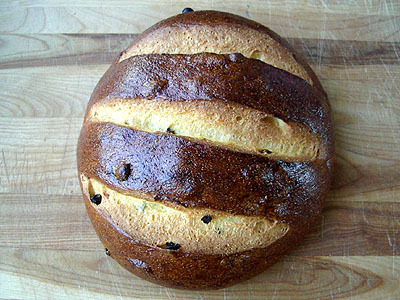 Your Sweet Corn Raisin Bread is just breathtaking! That is so very pretty. You just inspired me for the next loaf. Used your directions for the scissor cuts on an olive and thyme bread. It was so pretty when it came out of the oven! Thanks for posting this. I made this today with a few variations. I didn't have any raisins, so I used dried blueberries. I also sauted a cup of corn in olive oil until caramelized and then mixed that in. It is now cooling..so I'll have to wait to see how it tastes! This bread sounded interesting to me, so I adapted the recipe over to a no-knead method. I've posted my adapted recipe, together with a bunch of step by step pictures at http://www.recipesonrails.com/recipes/show/525-sweet-corn-raisin-bread . Bread got a thumbs up from the family :) Thanks Floyd for the inspiration. I was thinking about trying this out with buttermilk instead of milk. Does anyone know was kind of effect that might have on yeast activity? I'm wondering about adding some tumeric for coloring the loaf instead of the saffron that you are too cheap to use. What do you think? This was the first recipe I made from here after I found this site, and it was so good. I will deinitely make this again! I made this today, with some modifications, and it turned out pretty nicely! I used molasses rather than sugar; I like the combination of flavors that corn flour and molasses provides. I used 1-1/2 TBS of molasses. And... in place of raisins, I decided to use dried blueberries; they just seem to go with the corn flavor to me! I decided to use my brand-new brotform for the final rise, as well. The dough is a bit too soft for this, probably, but it was my first opportunity to use my new toy. If I can figure out how to upload pictures, I'll post it here! Is some of the milk used in th soaker? Paragraph two says "add remaining milk", which seems to indicate it is. The moistest, non-gritty yeasted corn loaf I've made to date. It was still moist 3 days later. Reheated the raisin soaking water and used it in the soaker. Made a 9 x 5 loaf (2-1/2 lb) and it rose and baked beautifully tall. Not over-proofed. I ended up adding a bit more flour and maybe 1/8" tsp more yeast because I put too much liquid in the soaker (my aging eyes misread), then had to adjust to get the correct dough, but it came out great and my husband agrees it's a keeper. Next time I'll use a banneton and play with variations. Another great recipe from floyd. I was reading through some of freek's old posts and ran across one that led me to this loaf of yours. I love that we can do that! As others have said, freek included, I made modifications which included using the corn to make polenta that then had pumpkin puree, cream cheese and nutmeg added to while it simmered. The resulting loves got rave reviews. Haven't made this since last year - enjoyed it. Corn sounds good right now while we're impatiently waiting for our garden crop to be ready in late summer. If necessary for time constraints, is it OK to bulk-ferment this dough in the refrigerator for several hours? Wow , the oven rise on this was more that I've even experienced in one of my breads, perhaps because I usually work with more whole grains. Will make my slashes larger next time - In spite of my usual cuts, the loaf tore as it baked. Looked and tasted great nonetheless. Used half polenta and half regular corn meal. Next time may do an overnight soaker with the corn meal as Peter Reinhart prefers for all of his whole grains. My apologies, I'm certain I am missing something. In the paragraphs below, where am I initially adding milk that I am then adding the remainder? Thank you!